When it comes to Indian food, I bloody love it. Seriously, any type of curry house and I’m there with bells on. But there’s one type of Indian cooking that is always top of my list and that’s Indian street food. I’m not talking about westernised kormas, masalas or vindaloos, I’m talking about proper food right from the heart of India. Someone that really knows how to do that is Patri founder, Puneet Wadhwani, who has created a never-seen-before menu that brings to life the snacks and dishes he once devoured lovingly as a child who grew up within a bicycle ride of New Delhi train station, and of those he remembers eating whilst being on board India’s great rail journeys. These famous rail side snacks, such as ‘girlfriend chaat,’ are cooked on the platform and handed to travellers through the windows of passing trains which sounds like the absolute dream, I mean that certainly beats grabbing a bag of crisps from Smiths, to the fragrant curries, such as, ‘rara gosht,’ which would actually be cooked on board the train. Patri’s menu has brought to life all of these flavours and so much more. 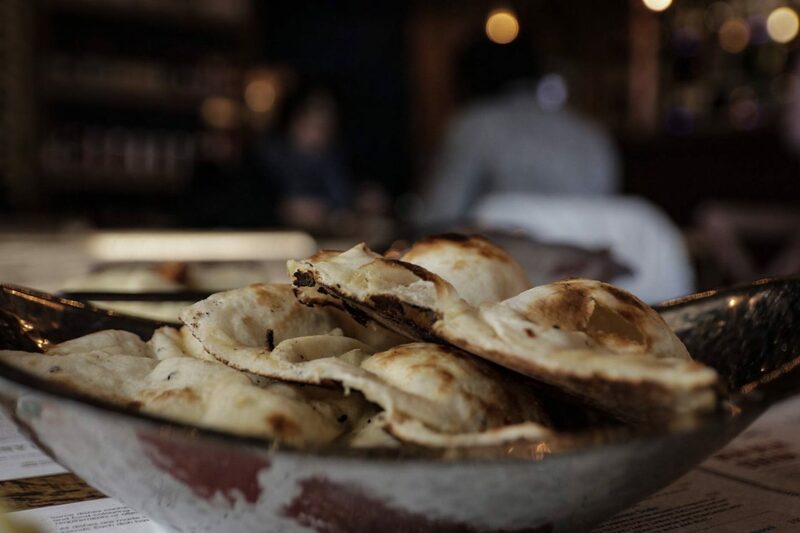 With Patri, only being open a mere 8 weeks, meaning train track, their launch menu features dishes that have been particularly inspired by the historic New Delhi Station and the great Marwar Junction. My mum and I hopped on a train and popped along one lunchtime to try out the menu. There were so many things on the menu that I really wanted to try, and I was more than able to stick to my meat-free eating as Indian food always has the best vegetarian options! 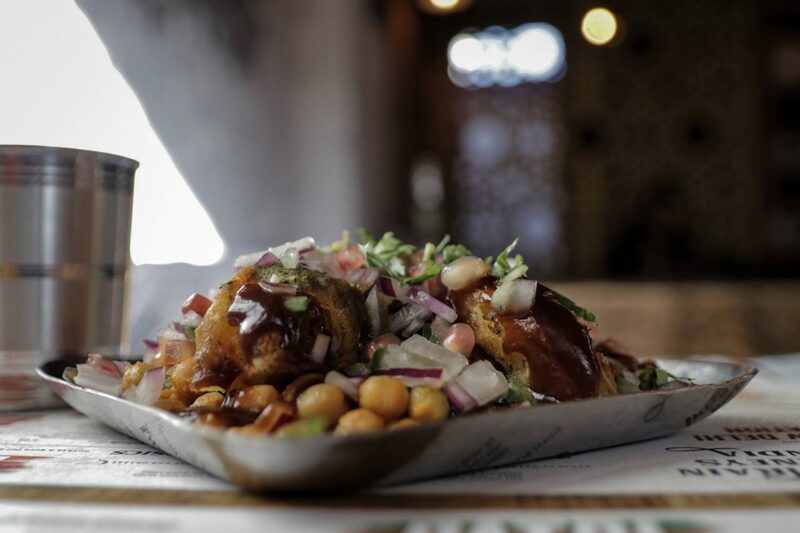 We didn’t want to go to heavy as it was only lunchtime so we decided to share the Chatpati Aloo Tikki Chaat as our starter. This consisted of two stuffed spicy potato patties that were served on a bed of boiled chickpeas drizzled with tangy lemon, vinegar onions, tomato and pomegranate and topped with tamarind and mint chutney. This was the perfect size to kick the meal off with and we found out that it’s one of the most popular small plates on the menu and we can totally see why. For mains, I could resist the Achari Malai Paneer Tikka as paneer is quite literally my biggest weakness. Whenever I go for an Indian meal I just have to order some and this around I went for in the form of the cheese being cut into squares and marinated in yoghurt, spices mustard oil and spicy chilli pickle. 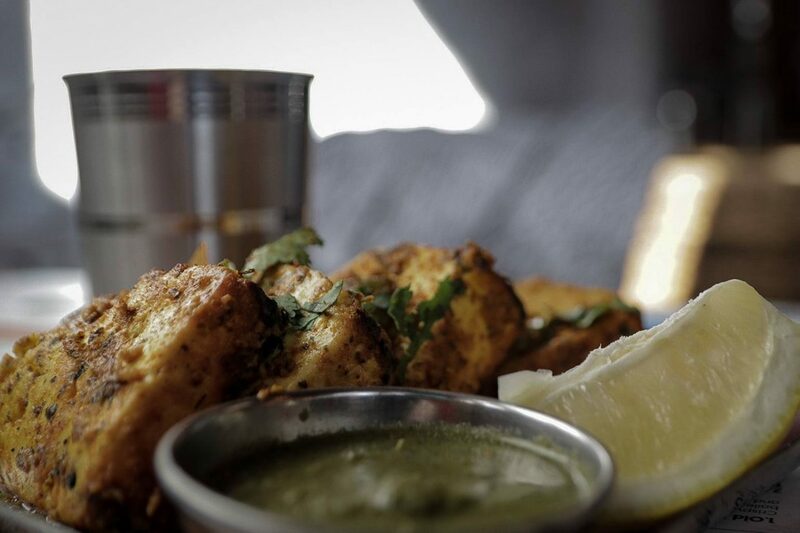 The tenderised paneer is roasted in the tandoor then topped with cream and chat masala and is so bloody good! I really didn’t want it to come to an end! 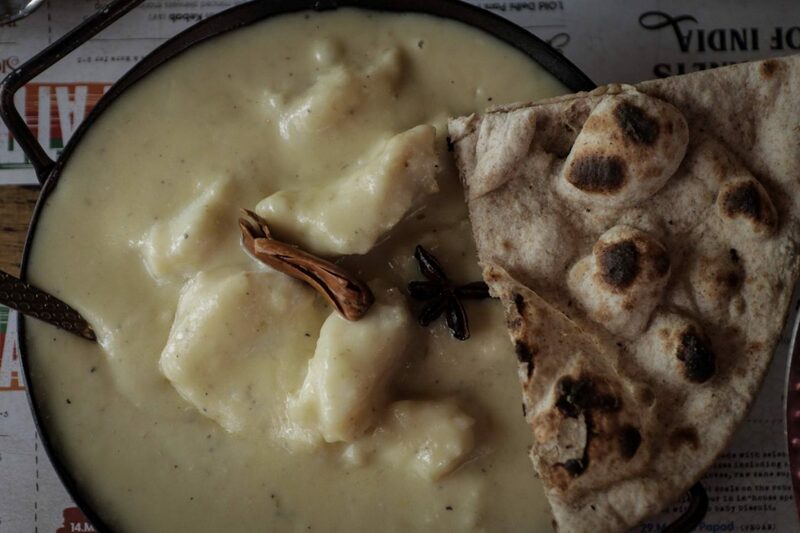 Mum is quite a fan of a fish curry and she was so excited to try the Safed Machi Maas which is made from tender monkfish cubes that are slow cooked with whole masalas, almond-cashew paste and a generous helping of cream, milk and curd. This then creates a luscious texture with quite a heavy sauce that’s royal white in colour that’s derived from fresh cream, yogurt, khoya and dry fruits. As sides, we had a bowl of pilau rice to share as we were still going light for it being lunch, but I did order a Butter Naan which is a North-Indian style flatbread made with maida, Indian refined flour which is quickly baked in the tandoor and topped with nigella seeds, coriander and unsalted butter. It was perfect for dipping in the Safed Machi Maas sauce and it wasn’t stodgy as many naan breads can be. As Mum isn’t big on naan bread she ordered her own Tandoori Roti which is a really lightweight wholewheat flatbread which are prepared traditionally in the tandoor to a crispy finish. She also used it to dip away at the lush sauce on her curry. As Mum’s curry was such a big portion she took half of it home, with the remaining rice and breads which was actually enough for dad to have dinner that evening! He very much gave the meal his sign of approval. I was also lucky enough to not be leaving empty-handed as the wonderful Puneet sent me home with a goodie bag of my own. As I had mentioned, whilst chatting to him that I was trying to lower my meat intake and how good vegetarian Indian cooking was, so he treated me to a portion of the Daal Makhani, his mums speciality, which is slow cooked black lentils that are cooked overnight on the tandoor and then stirred for 8 hours in butter and tomato sauce, before serving the very talented head chef gives it a tadka of dry roasted spices and cream. Also, I received a portion of the Vegan Dhaba Panchrattan Daal, panchrattan means five jewels, so this roadside speciality consists of mixed lentils boiled in a pressure cooker and tempered with ginger, cumin, coriander and garlic. For the past two evenings, I’ve cooked some rice up and we’ve eaten the most amazing daal for dinner and has further proven that Indian food really does hold the most flavour, the most textures and the least need for meat! We had such amazing service at the restaurant and I really can’t wait to return to pair some incredible food with wine from the award-winning menu!